In 2003, the movie The Last Samurai put the region of Taranaki on the world map. Many locals still refer to that time as the "Samurai Summer". Back in 2003 I watched The Last Samurai and saw Taranaki's amazing volcanic peak on the silver screen. It took me a while, but I finally got to check out what this part of the country had to offer - and I was amazed. And it seems I'm not the only one blown over by the charms of the region. 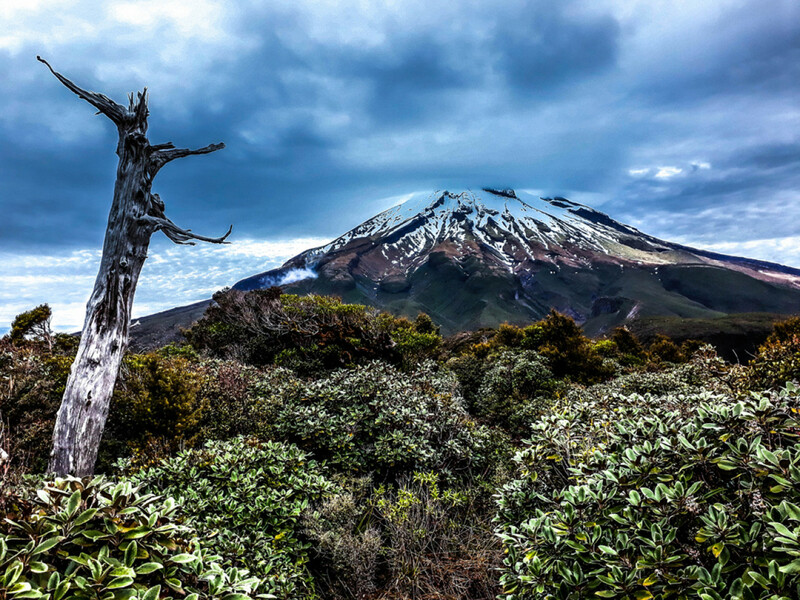 The Lonely Planet recently declared Taranaki the second-best region in the world to visit. I was fortunate to be invited to this beautiful part of New Zealand by Venture Taranaki, who put together a film-focussed smorgasbord of all that the destination has to offer. The morning sun came out when I pulled into Pukekura Park, one of the country's most renowned gardens. The park's lake with the Poet's Bridge in the background. I parked at the main entrance, right next to the Cricket Grounds that were converted into the parade area for the Japanese Imperial Army in The Last Samurai. Here, I was met by park curator Chris Connolly who had agreed to show me around his realm. We started off with some sceneframing shots around the grounds before venturing deeper into the park. 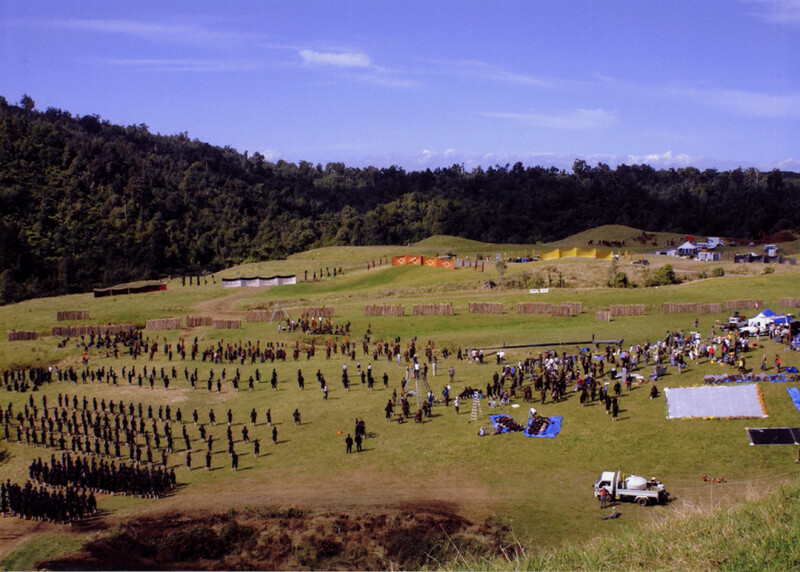 The Pukekura Cricket Grounds during the filming of The Last Samurai in 2002. Chris showed me the various highlights, including the Fernery, the lake, the old colonial hospital and the picturesque Chinese Garden. The entrance to the Chinese Garden. After a morning strolling around the park, it was time for some action. So I joined Jason Kowalewski from Back 2 The Wild Tours for a ride through some of the region’s best mountain biking trails around Lake Mangamahoe. The lake also happens to be the filming location for the first battle scene between Captain Algren's Japanese Imperial Army and the Samurai warriors led by Katsumoto in The Last Samurai. Jason wanted to show me where the main production base for The Last Samurai was set up and we had an easy ride there. In 2002, the location was a simple paddock. When you enter the location these days, you end up in a cemetery (literally!). Jason talks about the production base for The Last Samurai. In the photo, you can also see Charlie Harrington who was the location manager for the movie. After this interlude, the biking became a bit more serious. We followed a gravel track down into the forest and onto a trail that weaved in and out of the bush and then up to the top of a hill. I had hoped for a clear view towards Mount Taranaki, yet the weather gods refused to play ball. The next leg down to the lake would be the fun part. Jason points out the next part of the track. I knew this one would be challenging. This downhill part was extremely slippery and rutted. Knowing the track well, Jason raced ahead. I tried to keep up which only resulted in me doing a somersault over the handlebars. Thankfully I had a soft landing, as my fall was cushioned by a small bush! Once we hit lake level, the going was easy and we had very smooth and flat riding terrain along the lakeshore back to our vehicles. After a short lunch break, I made my way down to New Plymouth's port to meet up with Captain Chaddy who runs a popular island cruise in a historic lifeboat made in England. Captain Dave 'Chaddy' Chadfield. I have never seen bigger hands than Chaddy's. He used to be a professional boxer in his younger years and I really feel for his opponents. Our route led us out of the harbour and towards the Sugar Loaf Island reserve. The swell was considerable and anyone with a weak stomach would probably have fed the fish. Chaddy loves to have a good yarn and he had some great stories about the whalers stationed on Moturoa Island. We watched some seals on the rocks basking in the sun and set up a fishing line. The furthest island called Motumahanga is 1.5 kilometres off shore. On our way back into the harbour, Chaddy pointed out the area where the production crew had built the Yokohama harbour set for The Last Samurai which unfortunately no longer exists. Part of the original harbour film set from The Last Samurai. It was completely dismantled after the filming. 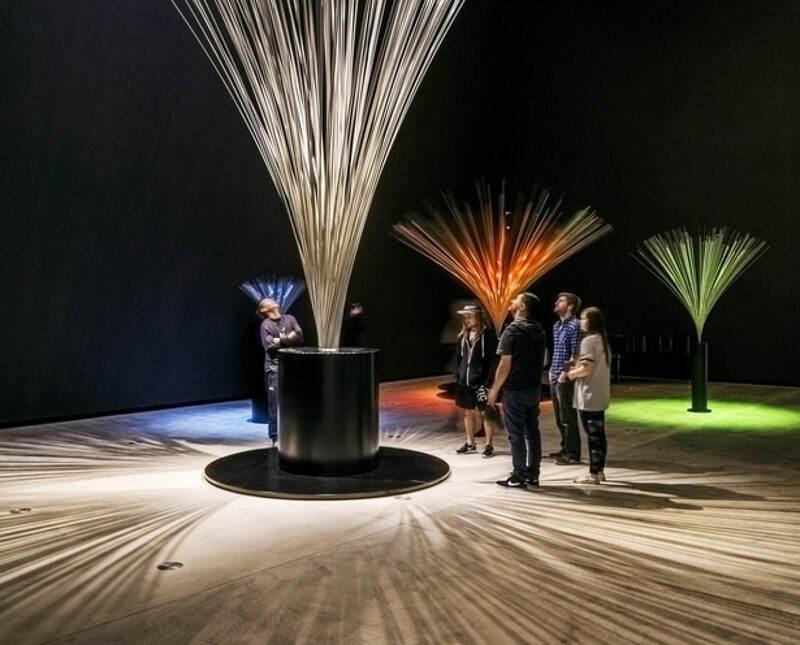 Back in town, I paid a visit to the Len Lye Centre, a contemporary exhibition space dedicated to New Zealand-born experiential filmmaker and kinetic sculptor Leonard Charles Huia Lye. Some of Lye's kinetic exhibits: Fountain III from 1976, made from stainless steel rods. A motor rotates the metal rods, creating the illusion of a jet of water. The centre's curator, Paul Brobbel, introduced me to Len's unique 'direct animation' techniques whereby film celluloid is treated like a long canvas onto which images can be painted, scratched, or etched with light. Lye even used this technique in an incredible advertisement he made for Imperial Airways (the forerunner of British Airways) in 1938. I was also impressed by the Centre's state-of-the-art cinema where audiences are treated to screenings of arthouse and foreign language films. While Lye's sculptures are pretty amazing, the building's coolest feature is its reflective facade. After a long day, I decided to walk along the Coastal Walkway promenade back to my hotel and have an early night. Just before I reached my hotel, Len Lye's 48-metre outdoor sculpture "Wind Wand" gave me a final nod. The red fibreglass tube stands vertical when it's still, but bends with the wind. It lights up at night which gives it a pretty cool effect. The second day of my Taranaki adventure was dedicated to hiking the Pouakai Crossing, an eight to nine hour walk on the slopes of Mount Fujiyama's stand-in Mount Taranaki. The picture-perfect shape of the volcano was the reason why The Last Samurai filmmakers decided to shoot most of the film in the region. I was fortunate enough to have the company of local mountaineer and Top Guide Jeremy "JJ" for the day. I have done a fair bit of hiking in New Zealand but I have to say that this hike is not to be missed. The track is varied and leads you through a wide range of different landscapes, including rainforests, wetlands and subalpine bush. For the first few hours, the track climbs steadily through montane forest and subalpine bush. Here JJ traverses the extensive Ahukawakawa wetland. Mountain view from the west. It took us seven and a half hours to complete the track, including a few breaks. By the time we arrived at the road end and climbed in our vehicle, I was looking forward to a decent meal and a relaxing soak and massage at the Taranaki Thermal Spa. Housed in one of the country's oldest bath houses, it's the only spa in New Zealand that uses alkaline mineral water (as opposed to thermal water). The cast and crew from The Last Samurai were regular customers and it's easy to see why. You can either soak in the large public spa or opt for a private one that gets freshly filled on arrival. At 10am, I was picked up by Fay Looney who is a renowned landscape photographer based in Oakura where some of The Last Samurai's main cast and stayed, including Tom Cruise. Fay became good friends with some of the crew and was allowed on set during filming to take photos and collect stories. Fay Looney's stunning photo of Mount Taranaki in the evening sun was used to promote the region during the release of The Last Samurai. Fay had promised to take me to the location of the final battle in the movie. The site is on private land but the farmer is happy to provide access to people who want to have a look. The location of the final battle during the filming of The Last Samurai. Over 500 Japanese extras were flown in from Japan for these scenes. Nathan Algren and Katsumoto eyeing up the enemy's lines. Fay and I stopped for a break at Okurukuru Winery. The estate overlooks the surrounding green hills and the views towards the ocean are stunning. After lunch and coffee, we drove the few kilometres to Fay's gallery Koru on Koru, a free exhibition space for local artists. Visitors to Fay's gallery are welcomed by some of her signature photographs. After visiting Fay's gallery, I decided to walk off some of the culinary treats I had overindulged in over the last few days. New Plymouth has an award-winning Coastal Walkway that closely follows the shoreline from the centre of the city for about 12 kilometres north to Bell Block Beach. My aim was to check out the Te Rewa Rewa bridge, opened in June 2010. Due to its setting and shape, the bridge has become an Instagram icon: When the conditions are right, you can line up the peak of Mount Taranaki in-between the bridge's features. The late afternoon light was beautiful but Mount Taranaki was hidden behind the clouds on the horizon. The Waterfront Hotel, where I stayed, houses the renowned restaurant Salt on the Waterfront. I had reserved a table the day before and was looking forward to tasting the lamb, one of the chef's signature dishes. The meat was incredible but I especially loved the dessert - pistachio meringue with berry and hibiscus creme. After dinner, I drove out to Paritutu Rock. I had read that the views from this outcrop over the harbour and the Sugarloaf Islands are well worth the climb, despite the gut-wrenching drop towards the summit. But once you're up there, all of Taranaki's coastline is at your feet. Goodbye, Taranaki. You're a stunner. The official tourism website of Taranaki provides plenty of inspiring travel content. I stayed at The Waterfront Hotel. Stroll through Pukekura Park and visit the cricket grounds, a key location in The Last Samurai. Book a guided mountain biking tour with Back 2 The Wild Tours. Captain Chaddy's island cruise has been around for decades. 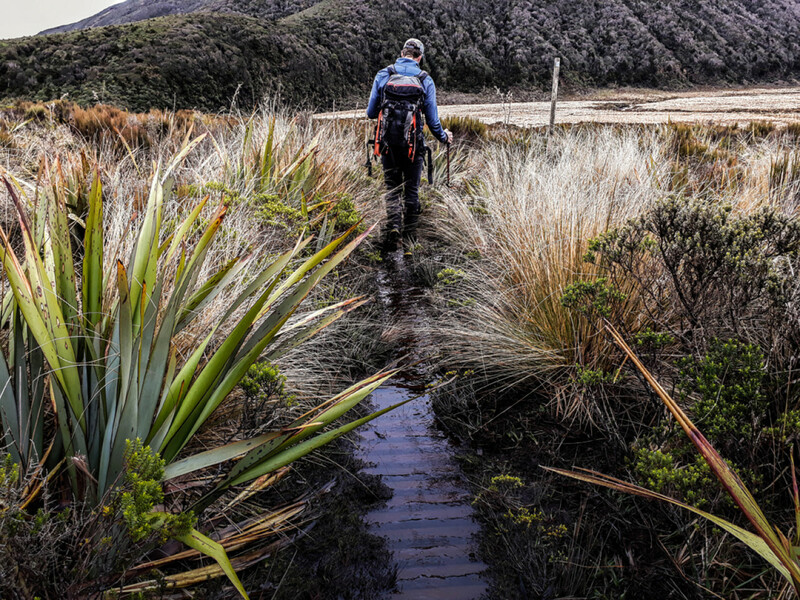 Don't miss out on the region's signature hike, the Pouakai Crossing. In case you prefer to have a guide with you, contact Top Guides, the only commercial operator licensed to take people up the mountain. For a relaxing evening soak and massage, try Taranaki Thermal Spa. If you're interested in seeing some of Fay Looney's stunning photography, you can visit her in her gallery "Koru on Koru".